Biography of Andrea d'Agnolo High Renaissance Painter. One of the great Old Masters of the High Renaissance, the Italian painter Andrea del Sarto (real name Andrea d'Agnolo) became the leading artist of the Renaissance in Florence from c.1510 onwards, following the departure of Leonardo, Michelangelo and Raphael for Rome. A master of fresco painting - witness his Miracles of San Filippo Benizzi (1509-10), the Birth of the Virgin (1514) and the Madonna del Sacco (1525), all in SS. Annunziata, Florence - he also produced great altarpiece art, as in the Madonna of the Harpies (1517, Uffizi Gallery) and the Assumption of the Virgin (1526, Palazzo Pitti), as well as portraiture - see Portrait of a Young Man (c.1517, National Gallery, London) and Baccio Bandinelli (c.1520, Uffizi). Although eclipsed by the likes of Michelangelo and Raphael, Andrea del Sarto ranks among the finest High Renaissance artists, not only for his sense of colour and his graceful oils, frescos and drawing, but also for his influence on Mannerist artists like Jacopo Pontormo (1494-1556), Rosso Fiorentino (1494-1540), Francesco Salviati (1510-63) and Giorgio Vasari (1511-1574). The latter's scurrilous and inaccurate account of Andrea did much to tarnish the Florentine's posthumous reputation. Apart from a visit to Rome (c.1511-12), and a 12-month visit to Paris in 1518-19 to complete several commissions for Francis I, Andrea del Sarto spent nearly all his life in Florence. Born Andrea d'Agnolo, but dubbed "del Sarto" (tailor's son) after his father's trade, he was first taught goldsmithing before he trained as a painter under Gian Barile, Piero di Cosimo (1462-1522), and later Raffaellino del Garbo. In 1508 he was accepted as a member of the guild of Medici e Speziali, and from 1511 he shared a studio with Jacopo Sansovino and Franciabigio. He first made his name by completing a program of mural painting depicting the Miracles of St Filippo Benizzi (1509-10), for the basilica (Santissima Annunziata) of the Servite convent in Florence, where he worked alongside other fresco painters like Franciabigio and Andrea Feltrini. In addition, he painted an Annunciation in the monastery of St Gallo (1511), as well as a number of grisaille paintings in the Chiostro dello Scalzo of the Scalzi in Florence (1511-26), illustrating the life of John the Baptist. After this, in 1512, he married Lucrezia (del Fede), who went on to act as the model for a number of his Madonnas, and then executed his most famous frescoes - the Birth of the Virgin (1514) and the Madonna del Sacco (1525) - which succeed in combining elements from Leonardo (1452-1519) and Domenico Ghirlandaio (1449-94) as well as Fra Bartolommeo (1472-1517), and which exemplify the High Renaissance style in Florence. In 1517, Andrea del Sarto produced one of his most famous religious paintings - his altarpiece entitled, the Madonna of the Harpies (Madonna delle Arpie). Commissioned by the Florentine convent of San Francesco dei Macci, this masterpiece of High Renaissance painting depicts the Virgin and child standing on a pedestal, flanked by angels and two saints (John the Evangelist and St Francis). The pedestal is ornamented with figurines of angels, misinterpreted by Vasari as "harpies" (Italian: arpie) or evil female demons in the shape of birds. A pyramid-shaped composition, like Raphael's Sistine Madonna (1513), and Da Vinci's Virgin of the Rocks (1484) - see also similar works by Andrea del Sarto himself, such as Virgin and Child with a Saint and an Angel (1522, Prado, Madrid) and Sacra Famiglia Medici (Virgin and Child with St Elizabeth and John the Baptist) (1529, Palazzo Pitti) - the Madonna of the Harpies combines the lyricism of Leonardo with the elegance and grace of Raphael. It is regarded as one of the greatest Renaissance paintings of the late Florentine Renaissance. In 1518, Andrea del Sarto travelled to Paris, where he spent nearly a year at the court of the French King Francis I, completing several works of religious art. By 1520, however, he was back in Florence where he resumed work in the cloister of the Scalzo and the Santissima Annunziata. One of his final works is The Last Supper (1526-7, Museo del Cenacolo di San Salvi, Florence), a fresco painting based on similar works by Leonardo, Albrecht Durer and Raphael. It features a vivid series of portraits of Christ and his twelve disciples, marked by glowing colour, and arranged horizontally in a simple architectural setting. Andrea del Sarto died of the plague in Florence at the age of 43. 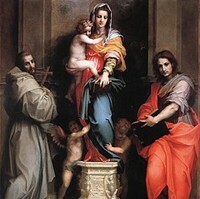 Highly thought of by Michelangelo, Andrea del Sarto had a marked interest in colour and atmosphere: his Madonnas, for instance, are characterized by their soft atmospheric qualities and a richness of colour, quite different from the linear focus and bright hues in the painting of Botticelli and Ghirlandaio. In addition, the gracefulness and elegance of his figures comes very close to Raphael. In 1523, for example, he painted a copy of the portrait group of Pope Leo X by Raphael which was so close to the original that even Raphael's closest assistant Giulio Romano (1499-1546) was completely fooled. Also, he was meticulous in his use of preparatory drawings before painting, an unusual habit which set the pattern for later artists. These are just some of the reasons why he is seen as the greatest master of the cinquecento High Renaissance in Florence, and an important precursor of Mannerism. Among his pupils and followers are Jacopo Pontormo, Francesco Salviati and Jacopino del Conte, as well as Bernardo del Buda, Lamberto Lombardi, Fiorentino, and Andrea Squazzella. In addition his painting was a strong influence on both Ludovico Carracci (1555-1619) and his cousin Agostino Carracci (1557-1602), co-founders of the Bolognese School of painting in Bologna. Paintings by Andrea del Sarto can be seen in many of the best art museums throughout the world, such as the Uffizi Gallery in Florence.  For more biographical details about eminent Renaissance painters, see: Homepage.